Artist income is one of the most pronounced growing pains of the streaming era. While there are many contributory factors, such as transparency and non-distributable label payments, the most significant element by far is how much artists get paid. There are many moving parts to the equation, not least of which is how much labels themselves choose to pay artists, but even if labels doubled their payments to artists (which would be a good starting point for artists on 15% deals) the underlying dynamic would remain unchanged. Namely that consumers are switching from buying music (which generates large upfront payments) to accessing it (which generates smaller payments spread over a longer period that as things stand look like they could still add up to smaller amounts even in the longer run). If you’re a big super star artist or a major label this doesn’t affect you much as you get such a large chunk of the headline revenue. But a new approach is needed for the rest. Enter stage left the case for user centric licensing. Under the current licensing model artists get paid on an ‘airplay’ basis i.e. what share of the total plays across the entire service the artist accounts for. This model can skew the revenue balance to the superstars who will get played by a very large share of the user base of a service. Under a user centric model an artist would get paid based on the share of an individual’s listening. So if a user spends half their time listening to an underground techno producer, half of the royalties go to that producer. In the existing model that producer would only get a tiny fraction of the royalties generated by that user. Let’s take a look at how this could work (see figure). If a subscriber listens to Artist B 55% of the time but that artist only accounts for 0.5% of total listening, only 0.5% of the available royalties for that subscriber make it back to the artist. Whereas Artist A who the user didn’t listen to at all gets 10% of the royalty income. But in a user centric licensing model the artist would get 55%. 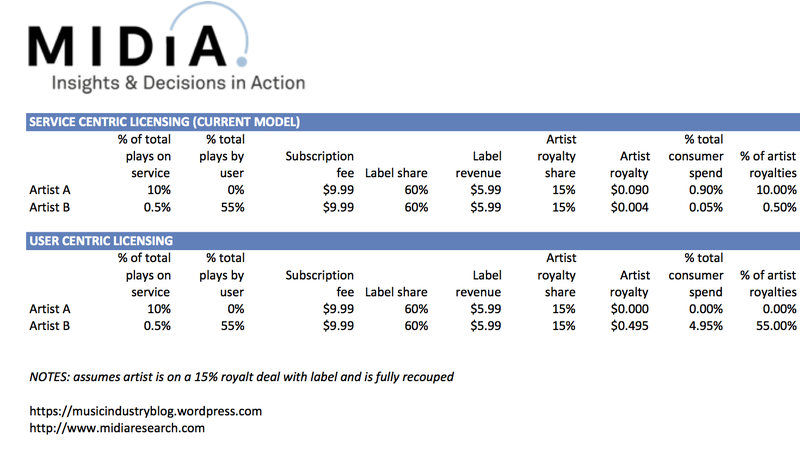 The revenue changes from a paltry $0.004 to a more meaningful $0.49 (assuming a 15% royalty share from the label). And Artist A gets a fairer zero income for zero listening from that user. Make no mistake, this model will be very difficult to license and the vested interests would likely resist it. But until we get to scale with subscriptions, we need to explore all ways of ensuring revenues are distributed on as equitable a basis as possible. This approach won’t fix all the artist-income ills of streaming but it will help smooth the transition. I’m not going to pretend to take credit for this concept, it’s been quietly gaining momentum for some time now and the Trichordist has been building the case too. But now is the time to really start giving this approach some serious consideration. And if the incumbent streaming services are unable to implement user centric licensing because they are too close to the superpowers, then this is an opportunity for a new streaming service to seize the initiative and start to make some meaningful change. I’m attaching the excel of this model so please go and stress test it yourself. Let me know your thoughts below. This entry was posted in Artists, Streaming, Subscriptions and tagged Artist Income, Licensing, Major Labels, Royalties, Streaming, Streaming Music, Superstar artists, transparency by Mark Mulligan. Bookmark the permalink. While this is certainly “the most fair” compensation strategy, it ignores the draw of superstars to a platform. When Taylor Swift said she wasn’t going to be on Apple Music, that was big news because without her there, most of her fans won’t participate. These superstars also help with discovery by finding the user similar artists. Now, if a platform adopts your strategy, these superstars aren’t incentivized to participate, since they’d be paid less. On the other hand, smaller, independent artists would happily move to your model. In the extreme, you could have a platform full of independent / small label artists, while the other platforms have primarily superstars. I’m not too excited to see a further fractionalized music landscape. Instead of figuring out how to divide the pot, these platforms should be looking at how to provide value to the artists so they can generate tangential revenue. The model is very intriguing for a completely different reason also. Currently record labels are really not incentivized to push their listeners to sign up for charged streaming services. In fact many of us are dis-incentivized given the paltry income we currently receive. As a label owner I would now want to really work with the steaming service to incentivize my listeners to sign up if i knew the service was going to compensate me not based on the imbalance provided superstars but more so who is paying and what are they listening to – hopefully Sumerian 24/7 LOL. As to the first comment, i must disagree. The superstars have nothing to worry about. The alteration in the numbers that may unfold given the suggested model will be healthy for everyone because the superstar artist free-rides as does the indie artist off other artist’s value. This model greatly diminishes the free-riding effect and more accurately reflects true listening habits. I wrote a report for KODA (the Danish Performing Rights Society) about this based on real-life data from WiMP (now Tidal) in Denmark. Though it might seem counterintuitive at first, mainstream artists are actually the ones who stand to gain most from this model since the current model figuratively lets casual users (who tend to be more into mainstream music) pay for some of the streams of intensive users (who have a stronger tendency to listen to more obscure artists). Thanks for the comments – very useful. The inescapable fact is that royalty payments are incredibly complex and will always lack full transparency due to commercial confidentiality. So the case I am making with this post is to create a model that is intrinsically easier to trust for artists. Over the next few years many artists and labels will see more revenue go to streaming but the total amount of revenue decline. All efforts need to be made to give artists as many reassurances as possible. Mark I want to focus on one issue you raise which is the issue of free and paid subscribers and its impact on the discussion. I do not know the differing compensation models the record industry earns for free and paid subscribers, but assuming the model is the same and the only variable is how much advertising the free user endures throughout the month, I can easily see a model moving forward where paid subscription is paid out on a per user basis and the free users ad revenue is paid out under the current system. This would allow those with the most vested commitment to streaming to compensate those they listen to. I would be very interested to hear others’ thoughts about this hybrid. It is still coalescing in my brain so it might not make sense but I want to share it with others thinking in this area. Hi Mark. The only ‘fair’ way to compensate artists/labels is based upon actual consumption by the individual subscriber. If a service knows I have paid my £9.99, then it is easy technically to count what I have chosen to play and divide my ‘net pot’ amongst the repertoire owners I have played only. If I follow the hyped mainstream pop then my play history reflects that and my subscription ‘pot’ is shared accordingly. If I choose underground niche then the same principle should apply. Of course there will be millions of the former and relatively few of the latter. So the majors (large catalogues and high promotion investment) will always win out in the big picture. So why doesnt this happen anyway ? Because the big licensing deals often come with ‘minima’ guaranteed market shares as part of the multi-layered ‘greater of’ conditions. Those market shares are based upon stats from the ownership mode ie sales. So the end result can’t be anything but subscription payments to labels reflecting (for the most part ) market shares from sales, regardless of actual subscriber plays. Remove that licensing condition and the majors will still dominate by the laws of numbers and public behaviour (ie most people play mainstream hyped pop), but the principle behind the system would at least be fairer to the long tail and maybe over time shift from, for example, 80%-20% dominance to a 70%-30% dominance. A per user revenue split is not only respectful to the creators but also to the individual subscriber. A subscriber chooses to pay a tenner each month to listen to precisely what they want. Statistically speaking, most still listen to the same hyped pop. But for those more discerning, why should music they play and have no interest in be rewarded ? Flip that round, if I could pay my tenner and only play for example, my chosen artist du jour, (eg Jarrod Lawson) knowing that he would receive my micropennies that month, then it could foster a direct artist support relationship for long tail labels and artists which incentivises and rewards them even within a mega mainstream music streaming service which favours the large-scale aggregator. There might not be enough $0.004s becoming $0.49s to significantly change the economic balance, but it respects the creator and respects the subscriber using the existing technology. Pingback: Spotify Still Pays Artists Out Of One Big Pot, Shouyld The Company Change Its Policy? - Welcome To All That Shreds Magazine!